This is a pic taken along College St near U of Toronto back in April when it was still cold and the trees were still bare. I've not eaten in either of these restaurants but the idea of Tibetan & Nepalese foods sounds good to me as does noodles. Taking past in Signs, Signs. Click HERE to see more signs from around the world. ...good choices along this street. I enjoy trying new restaurants! Recently we met friends at new Thai place here called Blazing Noodles. Thankfully the menu had the spicy dishes marked so I avoided them. The best thing I ate there were the Spring Rolls I ordered as an appetizer. Really good! Thanks for the tip. I will keep it in mind the next time I am in T.O. That does sound good. I think I'd be tempted to try these places. It would be very different cuisine! Very interesting and a nice photo, Pat. 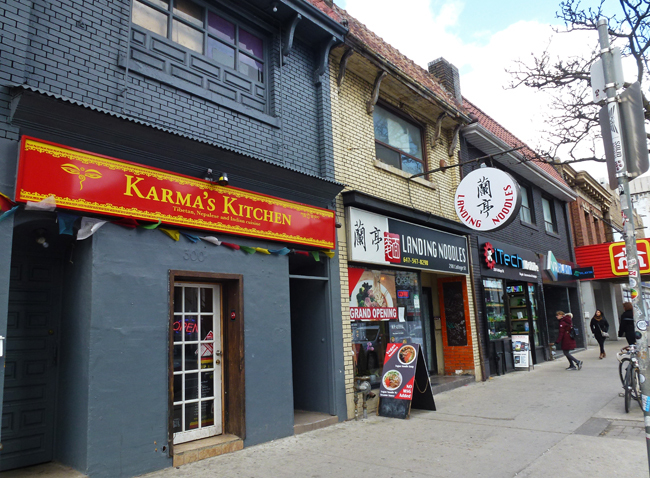 I'd stay out of Karma's kitchen, though 'cause I've gotten involved in so much mischief in my life that I'd have way too much "karma" to eat to make up for it! You always show some interesting restaurant choices. I wonder what Tibetan food is like. Interestingly, I noticed a Tibetan restaurant newly opened in my daughter's home town... so maybe I'll find out. Both restaurants would appeal to me and I would like to try both. Its karma to reach this point. Hello, I enjoy trying new restaurants. They sound good to me too. Always fun to try new restaurants, I like to find local and not chain restaurants when possible. What an interesting name, and so many choices along the way!